The Ovato platform seeks to revolutionize the loyalty rewards industry, social media and charitable causes. Its objective is to address the fractures that undermine full-scale participation and lead to a value leak from the existing ecosystem by using a blockchain approach. At the moment, loyalty reward schemes are costly since they impose an unnecessary tax liability on the operators providing service. But the value these services provide to the consumer is minimal and this explains inactivity among subscribers. This lack of enthusiasm dilutes the whole point of reward schemes both for the target consumers and business operators. Businesses consider loyalty programs a long-term debt and as a result have to implement periodic blackouts to make them cost-effective. This dilutes brand perception among clients. Consumers have also learned to pick only those programs with high flexibility and benefits to them. Social media and charities are other industries gravely in need of a revolution. Social network users have become aware of the multi-billion industry that operates at their expense but does not lead to any gains for them. Companies collect data from them and use it to educate and entertain but the data owners are not getting any compensation. On the other hand, charities now realize that 90% of their donations never really get to their destinations. This is because of the failures of centralized ecosystems. The Ovato token offers a holistic approach to dealing with the issues in every one of these sectors. 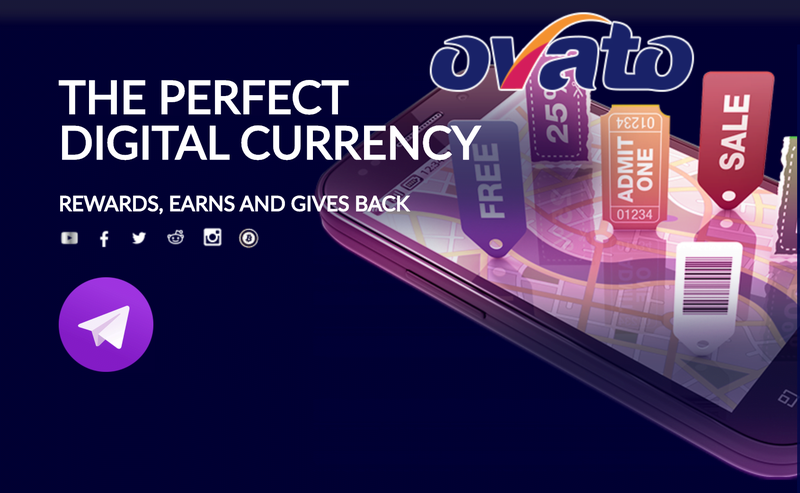 The platform plans to offer significant discounts on daily shopping as well as rebates and loyalty rewards for using the Ovato network. It will also assist merchants to market directly to their target audience eliminating costly intermediaries. Shoppers who share these special offers on their social media networks will earn rewards thus getting an incentive to keep the marketing cycle active. The final step will be to set the giving industry free by making funds allocations directly from the platform’s blockchain to phase out leakages in the process. A major point of deviation from the current loyalty reward system is that Ovato will allow merchants to decide what fraction of their gross profits they wish to issue out as rewards. When a customer enrolls in the program or makes a purchase, they are able to cash in on the reward right there and then. This system will use the blockchain to transfer rewards directly to consumers from the point of sale to their mobile device. Businesses will enjoy the provision of a low-cost reward system that will reduce their overheads. They will also have access to a global market base and the direct marketing feature will help small businesses appeal to a much broader audience. Network users will have the opportunity to capitalize on the benefits of social media marketing and earn tokens in the process. They can either create promotional posts or share the ones in circulation. Influencers and journalists, in particular, will enjoy the direct marketing feature that cuts out intermediaries who usually charge a hefty commission that eats into their profits. Additionally, with regards to charitable giving, the platform uses blockchain technology to allow for transparency and reduce wastage. Everyone in the community will be able to see how much has been donated to what cause and this will ensure that all donations get to their destination without any exemption. The Ovato community will vote on this aspect of the platform allowing as much public participation as possible. Bitovation is an already existing platform for rebates and rewards within the network that gives consumers bitcoins for participation. This platform has allowed for a pre-established coin distribution ahead of the network launch to facilitate mass adoption. Ovato is planning a crowdfunding event to raise the capital required for platform development and release. This ICO will offer the platform’s native ERC20 token, OVT with an aim of raising $30,350,000. This will start on March 27, 2018 and run till April 17, 2018. More information on the Ovato platform and its ICO is available on the network’s official website.